Angel Wings folded one over the other protectively is a lovely necklace made of solid bronze. 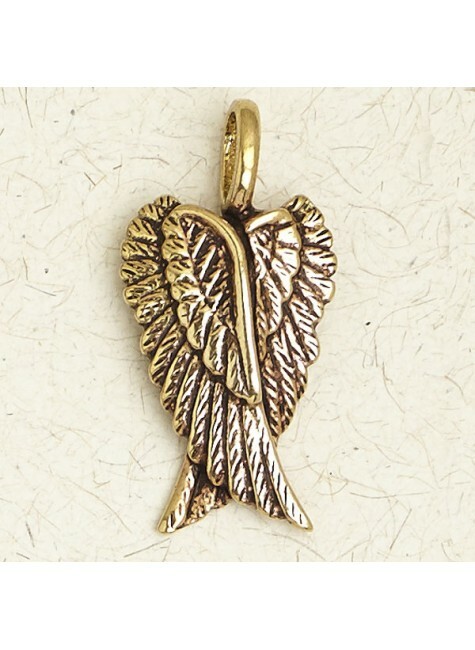 This finely detailed Angel Wing necklace is cast in the US of nickel-free bronze. It measures 1.25 inches long and comes complete on an adjustable 33 inch black neck cord. It comes packaged on a story card with description. Item Number: NV-BZP-400 | Approximate Size (Inches): 0.75 wide x 0.10 deep x 1.25 high | Approximate Shipping Weight: 0.25 lbs.